Security is a topic everyone should be acquainted with, and it is important to know all of the basic terminology so that you can buy smart when choosing a home security system. One of the things you’ll probably come across often is the phrase “crash and smash”. “Crash and smash” refers to a situation in which a burglar breaks into your home, usually by “crashing” through a door or window that is near the main security keypad. They then continue to “smash” the alarm panel, thus neutralizing the alarm system altogether. This method is very popular with burglars because alarm systems don’t automatically activate the alarm when someone breaks in. It can’t tell the difference between you or your family members opening the door or someone breaking it down or picking the lock, and that’s why you get a grace period of a few seconds to deactivate the alarm before it goes off. Most burglars either snip the wires leading to the alarm panel or smash the entire panel with a hammer or other object. 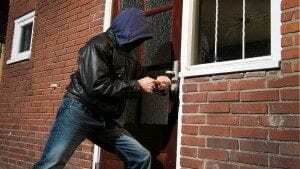 Burglars take advantage of this ‘free time’ by quickly breaking in and disabling the alarm, the violent way. Not only does this provide intruders with a security “loophole” to rob your home without any interference, it can also lead to very dangerous situations if someone is in the house when this happens. Can a crash and smash incident be prevented? Yes, it can. But you need to know all of the facts so that you install a security system that can protect you against this very common burglary method. Smart security systems take advantage of the fact that crash and smash break-ins are very low tech and use force to get the dirty work done. A system with crash and smash protection can use one of several methods to provide protection. One is to have the signal sent immediately as soon as the door is opened and if a disarm code is not sent out shortly after, the police are notified. Because the burglar smashes the system, no disarm code is sent and the police will be on their way while the intruders think they are safe. Another method involves “low tech” solutions. This isn’t completely foolproof but some prefer it because it is a cheaper solution and involves either placing a decoy panel for the burglar to ruin so that they think they are safe while the real panel activates the alarm, or place the panel in a separate locked room or somewhere hidden so that it takes them time to find it and deactivate it. While this method can help sometimes, it isn’t a good solution all of the time and burglars can work their way around it if they notice, so it’s best to rely on a security system that has full redundancy. When installing a wireless system, devices placed around your home will communicate with the alarm company either via a wireless connection or a phone signal, or in some cases – both. Wireless communications help protect against crash and smash break-ins because there is no way to disconnect the connection – there are no wires to snip and no way to block the signal without using technological solutions. Systems offered by Protect America use this method. Some alarm systems only send out a distress signal if you don’t deactivate the alarm within the given timeframe. If the system goes offline or is disabled by force then no alarm goes off. The method we mentioned previously is pretty effective and activates the alarm as soon as someone walks in the door or opens a window. If a disarm code isn’t sent within a given timeframe, then the alarm is “official” and the authorities are informed. Because the alarm code should only be known to family members, there is no way that smashing the panel or disabling the system can prevent the alarm from going off. Many security systems use this method and it is very effective because it is very straightforward. The home security company is instantly notified when the alarm goes off and if there is no deactivation by you then they know that something is wrong and make sure that the police are dispatched. Since burglars will be convinced that they have disabled the alarm, they will be taking their time and thinking that they are safe, making it much easier to apprehend and arrest them when the police get there. Some systems, like Link Interactive, have a feature specifically for crash and smash break-ins and it uses radio signals to monitor the system components and the control panel. If any of the system’s components is damaged, the alarm is set off. This means that a burglar that uses the crash and smash method would activate the alarm automatically when they try to break the panel. Make sure to talk to the company that provides the system and ask questions about redundancies and how they can protect you against burglaries, and read reviews to see what their customers are saying about their products.